The third generation Ford Mustang, commonly called the Fox Body, was sold from 1979 through 1993. You probably want a cool notchback version with the sweet 5.0 V8...but today we've got the bargain basement 4-cylinder version that was advertised for $13,270 out the door. Find this 1991 Ford Mustang LX here on eBay bidding for $4100 CAD ($3187 USD) with a few hours to go, located in Guelph, ON, Canada. 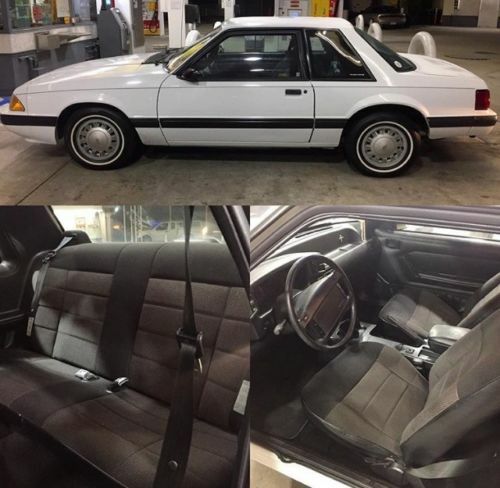 You're looking at a clean LX coupe with 24000 orig miles that would make a perfect daily driver or coyote swap. Body is rust free, all power options work and interior is 8/10. Undercarriage is immaculate. Still holds 90% of its original paint. Drivers door was resprayed at one point. Car is located in Canada and was brought over from California where it spent most of it life. Have clean tittle, in my name. Will help buyer with shipping to your front door although FULL PAYMENT is to be transferred before hand. $2500US deposit is due 24 hours after auction is won.